← Animal matching game is complete! Playground for The Care Center is complete! 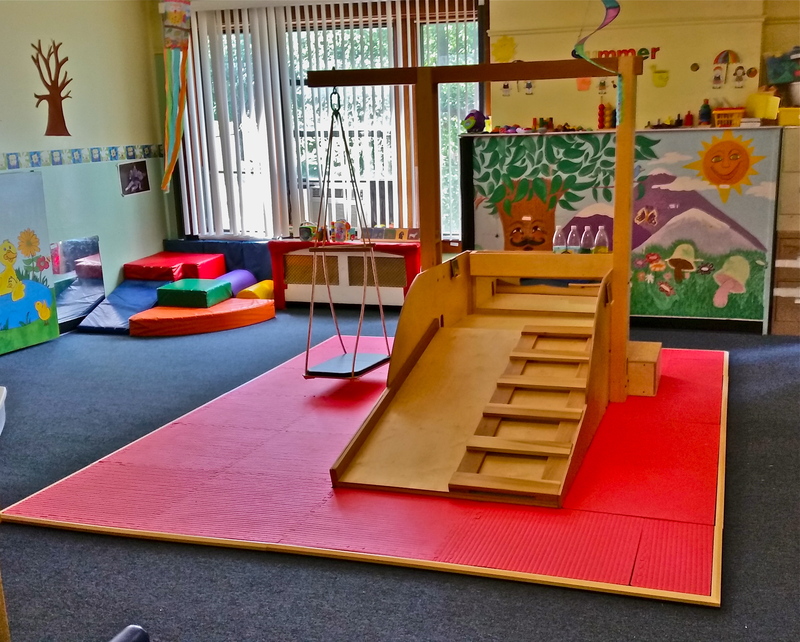 The second playground for children was installed on August 1st 2015 at the Care Center in Holyoke, MA. The Care Center is a wonderful program that allows young mothers to complete their high school education while providing day care and a learning environment for the infants and young children in the same building. The design for this playground is similar to the first playground built for the REACH Early Intervention Program, and will be used by children up to age three. I expanded the mat surfaces for this new one, so that there is a safety mat completely surrounding the structure. I am excited to see how the children respond, and this playground will get more foot traffic than the first model, as the children are present four full days per week. A huge thanks to Brian Gulick who traveled up from New York to help with the installation. Thanks also to Anne Techner and Aida Diaz and the staff at the Care Center, who will be giving me feedback on how it works. This new playground is dedicated to my dear friend Christine Sharkey, who recently retired from Cooley Dickinson Hospital after more than 20 years of dedicated and inspired work with children. Christine has always been a mentor to me, and her energy, creativity and work ethic have been an inspiration to a whole generation of pediatric therapists she helped bring together at Cooley Dickinson.